Box Office: Ittefaq And Thor-Ragnarok First Tuesday Business! Home BOLLYWOOD Box Office: Ittefaq And Thor-Ragnarok First Tuesday Business! Hollywood release, Thor: Ragnarok and Bollywood film Ittefaq’s first Tuesday business at the Box Office. 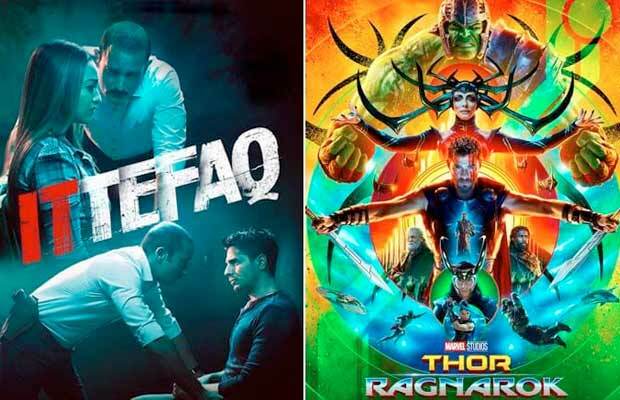 Hollywood release, Thor: Ragnarok and Bollywood film Ittefaq are currently battling out at the Box Office. Sidharth Malhotra and Sonakshi Sinha’s murder mystery ‘Ittefaq’ started on a decent note, while Thor: Ragnarok witnessed a bang on start. Ittefaq, a suspense thriller, earned Rs 3.80 crore net approx on its opening day and has witnessed a decent weekend. Directed by Abhay Chopra, the film has managed to collect Rs 1.75 crore net approx on its first Tuesday at the Box office. So far, the film has done a total business of Rs 18.80 crore (188 million) in five days. The film has witnessed normal week and is expected to finish first-week business at around Rs 21 crore net. On the other hand, Hollywood film Thor has witnessed its first drop at the Box Office in five days. Thor – Ragnarok, the superhero film earned Rs 7.75 crore net approx on its first day and continued to rule the Box Office on its first weekend. The film has earned Rs 3.25 crore net approx on its first Tuesday, taking total five days business to Rs 35 crore(350 million) net approx. The week is probably to end up near Rs 40 crore. Thor has recorded seventh highest opening Hollywood film of the year in India and it is the second best opening this year after Fast & Furious 8. It remains to see that Ragnarok being the biggest Thor movie will place itself where among Marvel’s output when it completes its run at the Box Office. Previous articleDid You Notice The Release Date On New Padmavati Poster?